Please note: FlexGui Toolbox is a free product. Click here for information about our demonstration package. To utilize all features on a real robot, you'll need a license. All FlexGui licenses can be bought through NACHI-FUJIKOSHI. FlexGui Toolbox in an integrated development environment for FlexGui Projects for Windows. 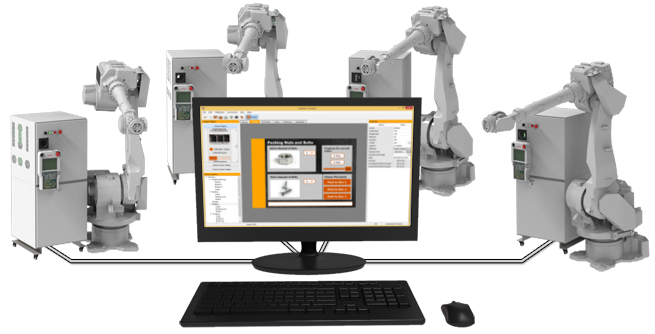 The goal of FlexGui Toolbox is to make development and testing for your robots as easy as possible. It can also be considered the hub for all your NACHI robots, with features such as backup and restore, management and FlexGui Remote. FlexGui Toolbox also offers tight integration towards NACHI's offline programming solution, FD on Desk. This enables your projects to be tested in an enviroment close to the real system before its deployed to your robots. An important part of FlexGui Toolbox is its server-capabilities. Firstly it is the server which the robots connect to if they are to be: developed for, updated, backed up, or even if the robot operator needs assistance through FlexGui Remote. Secondly, it can be set up as a proxy server for other Toolboxes to connect. This enables multiple experts to develop, manage and assist with your robots at the same time. Lastly, it is also serves services such as FlexGui Anywhere which enables smartphones, tablets and even modern web browsers to access FlexGui Remote. If FlexGui Toolbox sparked your curiosity, we recommend you to try the FlexGui Toolbox demo package.